We have lost one of the great ones, Paul Scofield has died at age 86. Yes, he's looked 86 ever since he played King Lear for Peter Brook 40 years ago! But then again, that was just part of his magisterial mojo. I've just spent the last half-hour scouring YouTube for my favorite Scofield clips. 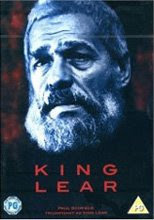 Alas, nothing from Brook's King Lear film, almost nothing from his chilling Crucible turn (as Rev. Danforth), and not even the wonderful "chocolate cake" duet with Ralph Fiennes from Quiz Show. But here's two gems. First, probably the clip that will be most shown today in honor of him: from A Man for All Seasons (his Oscar winning 1966 role) an oft-quoted speech about The Law. Once upon a time it used to be a favorite of conservative jurists. Now it provides some classy denunciation of our own rogue monarch. And now, a little Shakespeare. Paul and Mel as father and son. Not only the conservative jurists favored that speech about the law from A Man for All Seasons. It made an uncommonly strong impression on me when I first saw it. I've always thought (and still do) that part of the reason is the forceful imagery of Robert Bolt's text, but seeing the speech again I feel caught off guard, knocked back on my heels, by the way Scofield leaps to the attack. My God, he was great. Loved him in "The Crucible" and "Quiz Show," as well "A Man For All Seasons.". Always wanted to catch him on stage, but never did.